Well my long in coming post about my triathlon has finally arrived. Basically my wife (Veronica) and I trained for this for several months and then she became pregnant so I was forced to do this on my own. Some people. Anyway, I trained as much as I could biking around the neighborhood, swimming in the gym pool and at our neighborhood lake, and running wherever. The triathlon was at Bear Lake which straddles the border between Utah and Idaho and is really nice up there. We went up there the previous year with Aikman and Twix and had a blast so we wanted to go again with Jackson and Twix this year. So the big day comes, September 12th, 2009. The triathlon is called the Bear Lake Brawl and I was signed up for the Sprint. Which is a 750 meter swim, 20 km bike (~12 mile), and a 5K run. This is me all set wearing my speedo swim trunks and a t-shirt before getting ready. Veronica was not able to come down to the starting line because she had to watch over the dogs so she took this from a far. I am still technically swimming now. This is me running up the beach to the transition zone. The water was a lot rougher than I had anticipated it to be. I was literally swallowing water with every stroke and at times I had to "doggy paddle" just to keep going. It doesn't help that the water was cold enough to actually take my breath away. Since it was so cold you have to wear a wetsuit so that is what I wore, but running up they get partially stripped down. Being as I almost drowned swimming the run up the beach was exhausting as you can tell. Veronica made it away from the dogs to take this wonderful shot dying. I thought she was still over by them as you can tell in the last picture. This is also her favorite picture. And off on the bike. The biking was the next thing that killed me. My rear wheel was a little bent so it rubbed against the brake a little which didn't help the fact I was riding a little uphill and into the wind. Not to mention I was not very good at biking to begin with so this went downhill real fast. I did not pass 1 person swimming and everyone that didn't pass me then passed me on the bike. Finishing up biking at last with my worst time ever. Veronica missed my take off for the run but once I started running I actually felt pretty good since that was the focus of most of my training. By the end I actually passed a whole lot of people and was feeling pretty good. Until I stopped and then I just died for most of the rest of the day. All in all, not horrible but I definitely could have been better prepared. But you live and learn. I need to practice swimming more in colder water with larger waves. That is my biggest problem. I finished 21st in my age group out of 25. And that's not fog folks, that's pollution, or "inversion" as they like to call it. 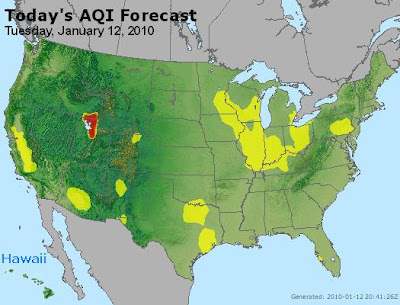 Yesterday we had the worst air in the nation. Today? I am sooo happy I had to run to the bus stop this morning. Probably took 20 years off of my life. So all in all, not too hard I think. Problems might come up when Gummy Bear comes in April though. Finally caught up on what I wanted to do with the Sith Lords page on my website. You can check out the list of all the updates on the Star Wars update page. School is over for the semester with an overall GPA of 3.975. Not bad. Back to work at URS for a few weeks of winter break so it's nice to not have to do school work non-stop. We finally own a washer and dryer now so I don't have to go back to that laundromat ever again :-D. The gummy bear's room is starting to be decorator and I finally got the guest bed integrated into my office. Christmas was good to me as well with a whole heaping of books, DVDs, and Star Wars stuff. Overall, a good year I think. Now on to 2010.